What is CTS-2010 Standard Cheque? What are the benefits? CTS stands for Cheque Truncation System, which is an image based clearing system implemented in India by the Reserve Bank of India(RBI) for faster clearing of cheques by collecting cheque images and MICR(Magnetic Ink Character Recognition) data and transferring them online. In this model no need to be send the physical cheque from the drawer bank to the drawee bank, instead the details are sent electronically. CTS was first implemented in New Delhi, then in Chennai and will be implemented throughout the country from 1st of April 2013. CTS system speeds up the cheque clearing system by eliminating the physical transfer of cheque leaves between the banks or branches. This also reduces overall cost involved in a cheque clearance process. 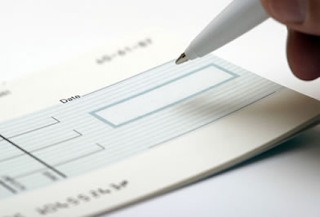 The improved security features prevents cheque frauds to an extend. What is CTS 2010 Standard? As of now the banks in India are using different formats for their cheque leaves mainly for branding, identification, security features etc. CTS 2010 introduced some standards and security features such as quality of paper, watermark, filed placements, bank’s logo in invisible ink, void pantograph, etc. ensures uniformity across cheque leaves issues by different banks in India. This standardization also helps the CTS system in easier image processing. How to identify a CTS-2010 compliant cheque? CTS-2010 compliant cheque will have the printer details along with the text 'CTS-2010' printed on the extreme left hand of the cheque leaf. My cheque book is not CTS-2010 compliant, what to do? You must obtain a CTS-2010 compliant cheque book on or before 31st March 2013. Go to your bank branch and request for a new cheque book or order one online. No non-CTS-2010 cheques will be encashed after this date. Those who have given non-CTS-2010 cheques for paying their Car or Home Loan EMIs must re-submit CTS-2010 standards cheques before the above mentioned date or switch to Electronic Clearing System(ECS). Thanks for this blog-post. All the information required is written here.